I’ve learned a lot about the history of philosophy this week but I thought I would end the week thinking about my own philosophy. 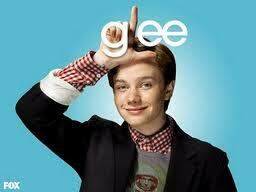 Glee is one of those uniquely spectacular shows that reminds you there is still quality TV out there. In my favorite episode, Kurt & Rachel compete for a solo from the musical “Wicked” called “Defying Gravity”. It’s a beautiful song and a great episode about overcoming limitations. I’m not going to lie; it brought a few tears to my eyes. Studying philosophy this week I think a lot of it boils down to us trying to make sense of our possibilities and our limitations. Where do we fall between those two things? As a kid I started earning the nickname “Darcie Don’t” because I tended to get into things. My grandmother worried I’d never want to do anything with my life, so she started calling me “Darcie Do” instead which luckily won out in the end. It became a good identity to foster into adulthood that lead me to a lot of great adventures. 4 years ago I went through a very painful divorce and something changed. That experience was followed by an incredibly demanding job where I didn’t have much opportunity for levity. I lost my ability to see things the way I used to & even though I tried to hide it I became a fragile person living with a lot more fear, depression and doubt. This year has been inspiring in so many ways, but there has been one experience in particular that has helped remind me that I’m not the kind of person to define myself by limitations. I started working with an organization called Paradox Sports and met Malcolm Daly who is an incredibly inspiring person to work with. As an organization they literally defy gravity, taking injured veterans and others with disabilities to places most people never see to do things like scaling huge walls of ice. Their events aren’t about helping disabled people feel “normal” but about reminding people of how amazing they are despite what’s happened to them or limitations they may live with. Every time I meet with Mal for coffee we end up looking out at the flatirons and he nudges me that he wants to teach me how to climb and get over my fear of heights. In honor of my new personal philosophy to “defy gravity” I guess this is me officially saying there will be a climbing week. When I decided to learn more about philosophy this week I found a great book, The Philosophy Book, that gives a quick & interesting background on many of the ideas we’ve all heard but may not have known where they come from. It’s a great book to get an overview on. One of the ideas that struck me the most was from Soren Kierkegaard, a Danish philosopher considered the father of existentialism who wrote “anxiety is the dizziness of freedom”. He uses an analogy I can relate well to (given my extreme fear of heights) of a person standing on a cliff or a tall building looking down. He says that person will experience two distinct types of fear. One fear is of falling while the other is fear brought on by the impulse to throw himself off the edge. It’s the second type, anxiety, that comes from the realization he or she has absolute freedom to choose whether to jump or not. Kierkegaard argues people feel the same “dizzying” feeling in their lives when they realize they have complete freedom to make their own decisions. It can be terrifying to know what to do with your life sometimes. I’ve had many moments of anxiety over the past year as I’ve transitioned from working all the time to exploring other things. There’s something that feels safe and secure about having the routine of a full time job. It’s scary not to know what I “should” be doing with my time and feeling uncertain about my next paycheck. Kierkegaard goes on to say that while having so much choice can induce a bit of despair, it also shakes us from our unthinking responses by making us more aware of the available choices. As a result we are more self-aware by opening ourselves up to what else might be out there. I know so many people who feel stuck in what they’re doing sometimes and are afraid to re-invent themselves because it’s an unknown. I also know a lot of people who, by choice or circumstances, have embraced the “dizziness of freedom” to see what else they might like to do. I really can’t think of a single case where that person wasn’t happier or at least closer to doing what made them happy. I guess you just have to tell yourself it’s not like you’re jumping off a cliff or anything. I was reminded on vacation there are still some cultures that aren’t as work-obsessed as we are out there. One of the most common questions you ask people in the US when you meet them is “what do you do?” Work is often a central part of conversation outside of work. As a result our work has become a key way to define ourselves, whether it be a marketing director or a stay-at-home-mother (hands down the hardest work of all). I’ve really noticed it over the past year as I struggle to come back with a quick reply when people ask what I do. At times I’ve thought it would be a fun game just to make something up and have fun with it. I’m a neurosurgeon or I’m a professional cat photographer. Or maybe I’m currently on leave from the circus. 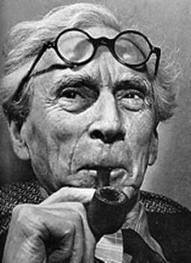 There was a 20th century Welsh philosopher, Bertrand Russell, who surprisingly in the midst of the Great Depression published a paper called In Praise of Idleness. He argued “the road to happiness lies in an organized diminution of work”. We need to work less. He cited the many historical examples of people devoting their whole lives to work while others reaped the benefits. He rejected the social ideal as being born out of religious principles that the “honest day’s work” was what made a person “good” or “virtuous”. He didn’t advocate not working but suggested people should cultivate other sides of themselves that equally contribute to civilization and society in important ways, like education, music and art. As he put it “moving matter about is emphatically not one of the ends of human life.” I think it’s easy to take a look at our culture and wonder why we’re working harder than ever, consuming more than ever but seemingly unhappier than ever. I take that back…the self help industry and pharmaceutical companies are probably very happy. At times work can be very fun, but at some point along the way I became a workaholic which wasn’t so fun. I can remember feeling guilty for taking vacation and always feeling tied to my phone when I did have free time. That said, I wouldn’t have the flexibility I have now had it not been for the hard work I did before. I am glad I didn’t just move on to the next bigger, better job though. Giving myself this time to see what else is out there definitely makes me believe we cannot be happy when we’re just about work. I’m sure this project will definitely give me lots of good ways to describe what I do. 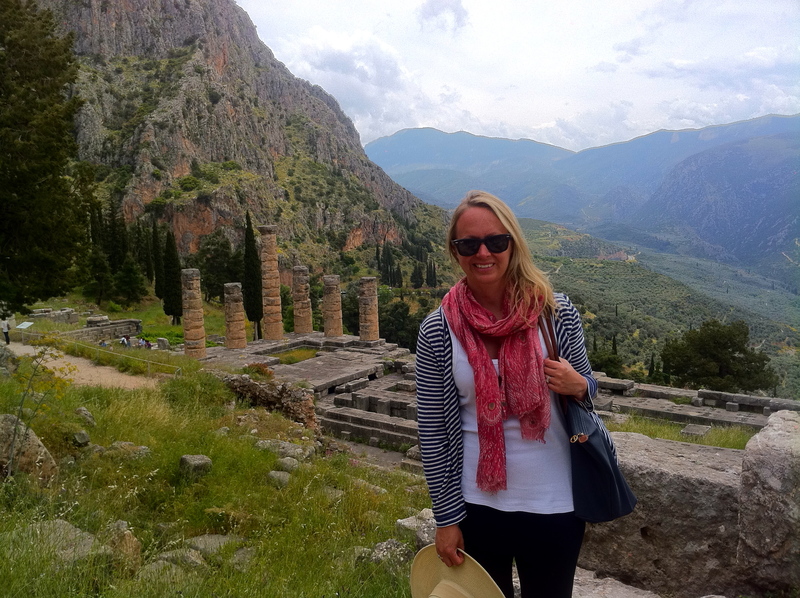 Today I went to Delphi to the Temple of Apollo and the site of the most famous oracle. It’s not only a fascinating piece of history but it’s a really beautiful spot in the mountains. I think I picked the perfect time to visit in Spring with all of the wildflowers blooming among the ruins. In thinking about philosophy, Delphi is another extremely important institution because people would travel from all over not only Greece but the rest of Europe and Asia as well to “find answers” ranging from personal questions to political advice to whether to declare war. I suppose the only equivalent nowadays would be tuning into Oprah. 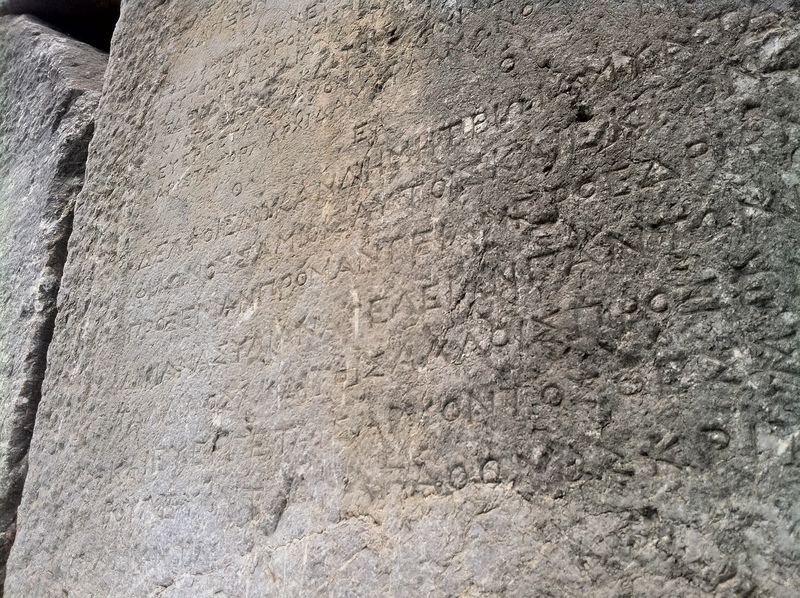 Although I couldn’t find it there today (surprising I don’t read ancient greek),on the entrance to the temple the words “Know Thyself” are inscribed there. I believe I had that on the wall of my college dorm at some point. Those words are odd for a place you have to travel hundreds of miles to in order to get advice from someone else. I guess in the end the oracle was more of a validation of sorts. According to a 10th century encyclopedia of knowledge “the proverb is applied to those whose boasts exceed what they are and that “know thyself” is a warning to pay no attention to the opinion of the multitude. It was sort of an “oh snap” to all of those 5th century BC people who thought they knew everything but really didn’t even know much about themselves. Those people were annoying even then. Even well after the ancient greeks were grappling with annoying know-it-alls, Benjamin Franklin wrote: “There are three things extremely hard, steel, a diamond, and to know one’s self.” I would agree. There have been so many times I’ve thought I understood something pretty clearly about myself only to find myself completely questioning how I could have seen myself that way. Time, circumstances and maturity seem to do that. I suppose knowing oneself and acting upon things that happen in the world can be two different things and the important thing is to try to be true to who you are at each step. At least that’s my interpretation having made the long journey to Delphi. I wonder what Oprah would say. Today I got to visit the Parthenon which is truly something to marvel at (other than the scaffolding on the front side). 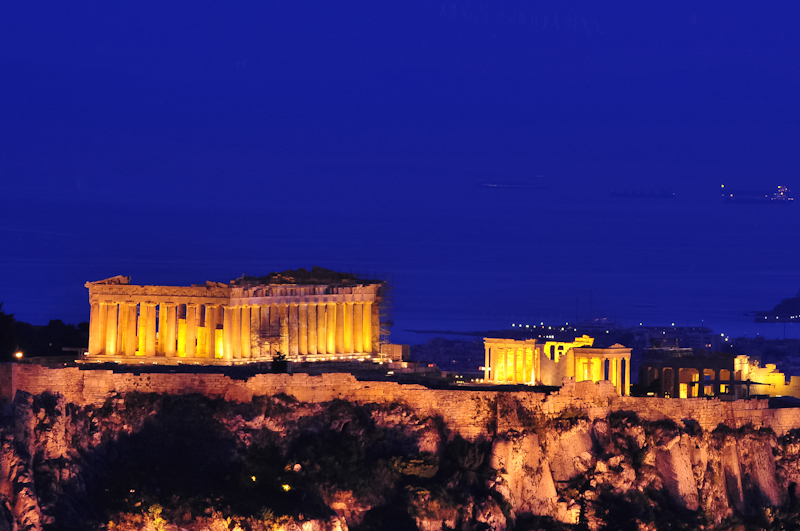 It was built in honor of Athena, the protector of Athens and the goddess of wisdom, civilization & warfare. Even though I studied mythology in high school, it’s way more interesting to learn about it as an adult in Athens. Greece was really the first civilization to worship the Gods in our own image which is really fascinating. Up until then, man was pretty much at the mercy of Nature or the elements and their gods & sacrifices reflected that belief. Gods were mainly reflections of the elements or animals or mythical creatures. It was really the first time people started seeing the gods as having more human characteristics and I think as a result as more relatable. I think it was also the first time that people began to see a human image as a force behind Nature, or at least as governing it in some way. It’s interesting that Athena became the most important God to the city of Athens because she represented “wisdom”. There was a strong need to figure out how people should interact with each other as well as how to act as a city-state. It’s easy to see how that led to the importance of the practice of philosophy at a time the Greek civilization was just becoming a civilization. There were lots of “rights & wrongs” to figure out. We could probably still use a lot more philosophy nowadays. Every time I visit a place like the Parthenon I wish I could see it as it was back in time. It really must have been magnificent. It’s pretty amazing that a structure built so long ago in honor of “wisdom” would serve as the blueprint for so many of our own government buildings to reflect the impact of greek philosophy on democracy. I know I’m probably simplifying a lot of this, but hey, it’s a blog, so I guess I get to just have my own interpretation. I’m excited to visit Delphi on weds to see the temple of Apollo, a God who was influential on philosophy in a whole other way. Since I was in Italy on vacation I thought it might be nice just to keep going to Greece to hang out with a good friend of mine from grad school, Adair. She works in the foreign service and I hadn’t seen her in 5 or so years. We had hiked up lykavitos, a hill near their house last night, and watched the sunset. Her husband Brad took the gorgeous photo above of the Parthenon. He also does photography work with the Embassy & you can check out some of his amazing photos here. He has some incredible photos of the riots in Athens. I also thought it would be fun to think about philosophy this week. In college, philosophy classes were some of my favorite classes I took, especially the classes on logic. It’s probably why I ended up doing strategy in advertising. I like figuring out “human truths” as we call them. This week I’ll be visiting many of the sights where it all began and reading about how it is we started thinking about ourselves in that way. Doing this blog has also inevitably gotten me to think about my own philosophy. I want to think more about that as well. You are currently browsing the 20 philosophy category at 52 To Do.